Tomorrow is the big day for Irish banks as the government unveils a plan to take over several struggling firms and expand ownership in others. Allied Irish Bank is trading down 17% today on news that the Irish government plans to take 70% ownership of the bank. The Bank of Ireland PLC is also subject to a 40% takeover, with total Irish government spending in the bank nationalization reaching 16 billion euros ($21.5 billion). Two other mortgage lenders and financial services providers, EBS and Irish Nationwide, are to be completely taken over as well. 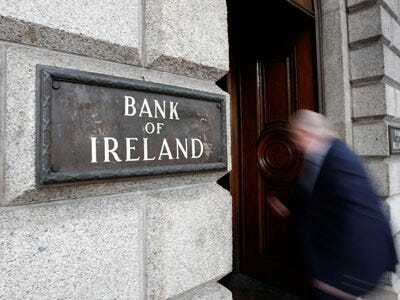 The Irish financial crisis has ravaged the country’s growth and put it in a state of depression.